1. 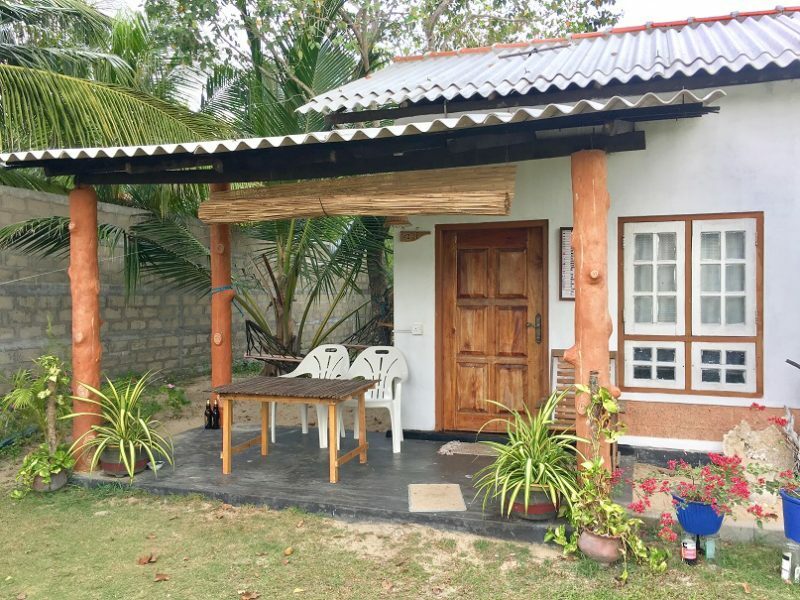 Finding your accommodation: I have never had so much trouble finding the accommodation we booked online as in Sri Lanka. In my experience, the locations listed in Agoda and Booking are usually pretty accurate. However, for for several accommodations listed below this wasn’t the case. Luckily, the helpful locals pointed us in the right direction. I have included directions for many of the places we stayed at as well as I could. But if you’re unable to find a place, just ask for help! The kind people of Sri Lanka are more than happy to point you in the right direction (or walk with you until you have arrived at your desired destination). 2. Home-stays instead of hotels: Most places we stayed at were home-stays, with only 1-3 rooms. I really enjoyed the small-scale setup of the accommodation in Sri Lanka. In Southeast Asia we spent most nights in hotels (10-15 rooms). Also very nice, just different. 3. Agoda versus Booking: I usually book with Agoda because most of the time their price is slightly lower than Booking and you can pay online with your credit card (thereby reducing your need for cash, which can be very convenient in some countries with hefty ATM fees or a limit on how much cash you can withdrawal per transaction). However, in Sri Lanka I found Booking often had slightly better offers. It’s a bit confusing that Agoda does includes tax in their price while Booking does not, this makes it more difficult to compare. Anyway, I always check both and book the cheapest option! Alright, to the point, where did I stay during my 1 month trip around Sri Lanka… In the map you can find the names and location of the accommodation. I’ve also added directions for accommodations where the map from Agoda/Booking wasn’t accurate. • I traveled around Sri Lanka with my husband, we spent 26 nights in the country and stayed at 16 different accommodations. • Our trip was in February 2017, the exchange rate was approximately 160 Sri Lankan Rupees (LKR) for €1 and 150 LKR for $1. 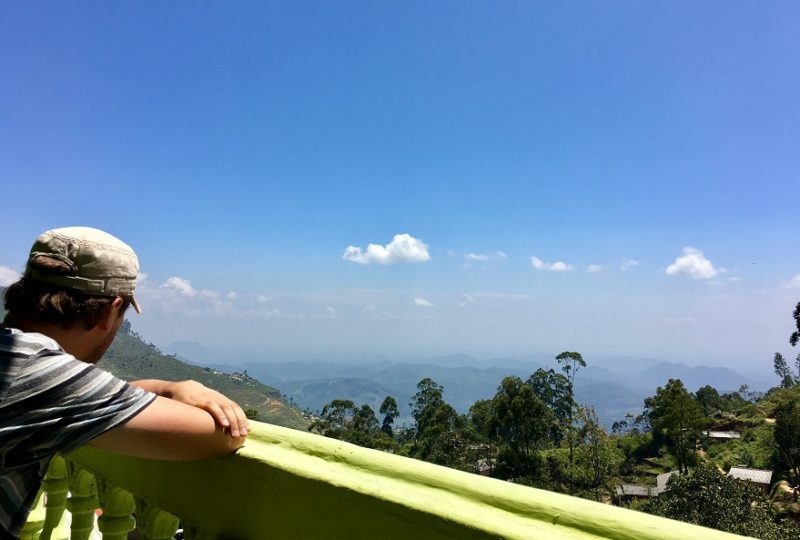 • Our average, our accommodation costs were 2500LKR/€16/$17 per night. + This accommodation is very close to the airport which is why I booked it. The kind owner picked us up from the airport, even though it was the middle of the night! The next day he drove us the airport bus center where we could easily catch a bus to Colombo. 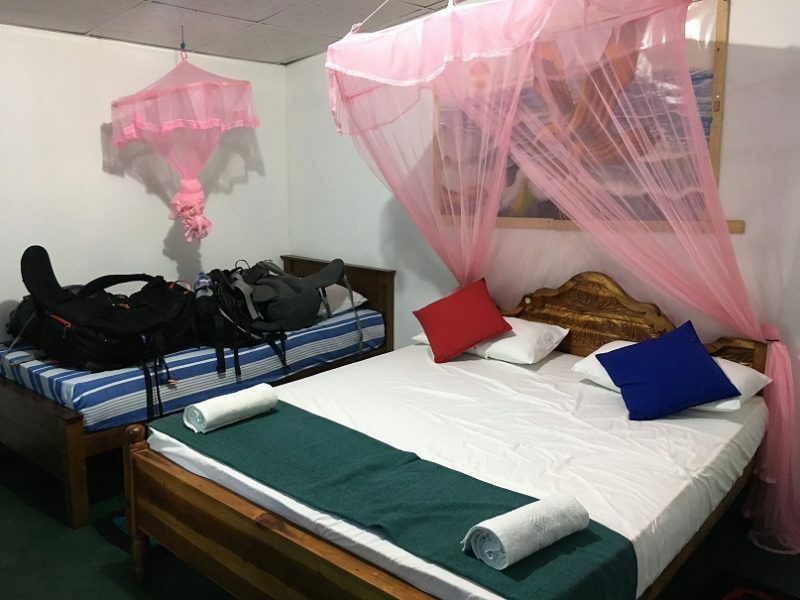 The room itself is basic but clean and has a mosquito net. Private bathroom, breakfast was not included. – It’s really close to the airport which means you’ll hear some planes fly over. • Agoda rating: 8,2 | Booking rating: 8. • Price paid per night: 1200LKR/€7,50/$8. • Check Erandi Holiday Home on Agoda and Booking. + Colombo is a busy and loud city, however, Siebel apartment is nice and quiet as it is located in one of the suburbs. The room is medium-sized and has a private bathroom. Everything was clean and the owner was very helpful. – WiFi was very slow. • Agoda rating: 7,8 | Booking rating: 7,6. • Price paid per night: 2500LKR/€16/$17 (breakfast not included). • Check Siebel Serviced Apartment on Agoda and Booking. We took the train from Fort to Kirulapona station. Exit the station and walk to the main road, turn right and walk up the hill. At the T-junction turn left and follow the road until you come to a cluster of small shops and a tiny supermarket. Turn right just before the shop (where they sell delicious and cheap kotthu for 150LKR) onto the small unpaved road. The road curves to the right, Siebel Serviced Apartment is the last house on the right. 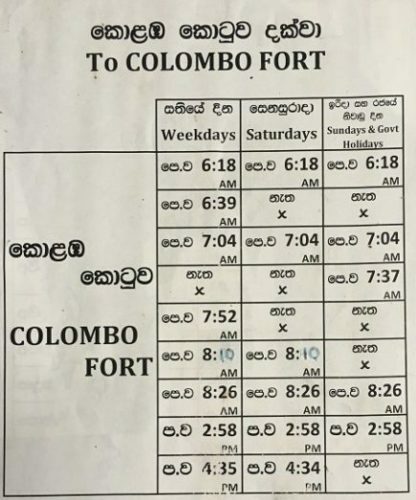 You can find the train schedule from Kirulapona station to Colombo Fort below. + The apartment is close to the center but not in the center of Galle, which means it is nice and quiet. A tuk-tuk to the center costs 100LKR. The apartment is very spacious! It has a bedroom, a large living room, a kitchen, a bathroom and a veranda where we had breakfast (included in the price). 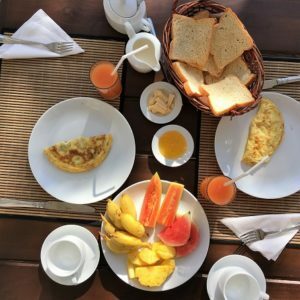 We had a delicious home-cooked Sri Lankan breakfast, with fresh fish the owner got at the market early in the morning (read more about what to eat in Sri Lanka in this post). WiFi was good too. We rented a scooter for a day (1200LKR) and explored the area around Galle. Laundry service available (450LKR per kilo). A really great place to stay in Galle! – Nothing that I can think of. • Price paid per night: 2750LKR/€17/$18. • Check The One on Agoda. 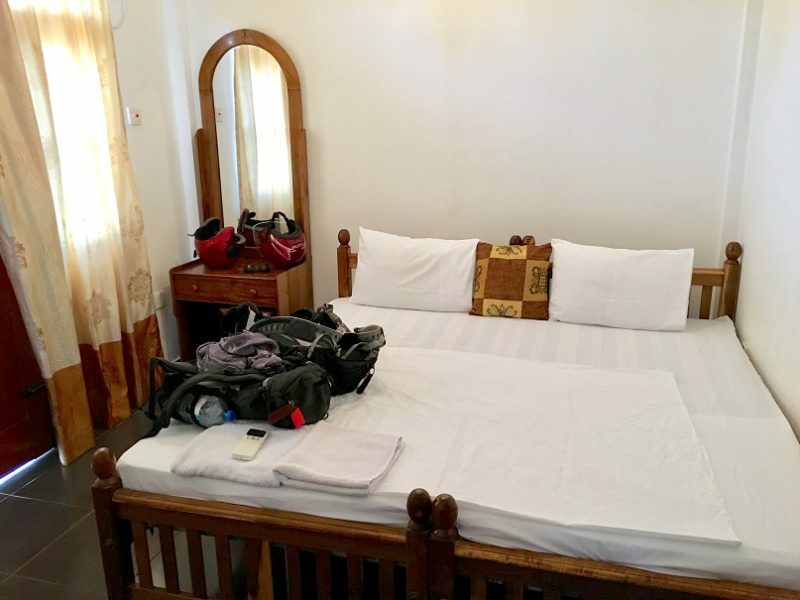 + Excellent price quality, it was the cheapest room we stayed at during our Sri Lanka trip. Large room, nice owner who spoke perfect English. WiFi was good, though not very stable. The view over the river is great (though we couldn’t see it from our room). There is a nice place for lunch/dinner across the street called Proud Resort (on the main road between Weligama and Mirissa). – Shared bathroom (reasonably clean). • Agoda rating: 9,2 | Booking rating: 8,5. • Price paid per night: 1000LKR/€6/$7. • Check Naomi River View Villa on Agoda and Booking. It took us ages to find this place! The location on Booking is incorrect and the name of the property is also different than on Booking. On Booking the accommodation is called River View Villa, the actual name is Naomi River View Villa. A small difference but it made it quite hard to find the place. A very kind Sri Lankan local walked with us for more than 1 km to make sure we would find it. Once you know where it is, it’s actually very easy to find the accommodation. You can take a bus from Welligama city center (10LKR per person) and get out at Proud Resort. Take the small road opposite Proud Resort which crossed the railway and curves to the right after a couple hundred meters. Follow this road and take the first road on the left. Naomi River View Villa is signposted, it’s at the end of the road on the right. + We hadn’t booked anything before coming to Talalla because everything online was fairly expensive (€25+). When we stepped of the bus we were welcomed by a man asking if we already had a place. No, we didn’t. He led us to his home-stay and showed us the room. The room looked nice and the price was good, so we decided to stay. The room was a bit small, but the adjacent (shared) balcony was very large. It was a great place to sit, read, relax and do a bit of blogging. WiFi was good but the owners did turn it off every now and then (I don’t know why, I asked for it to be turned on again several times). Breakfast was included (fresh bread, omelet, jam and tea), the vegetarian dinner was 650LKR per person. Not cheap but it was really good! 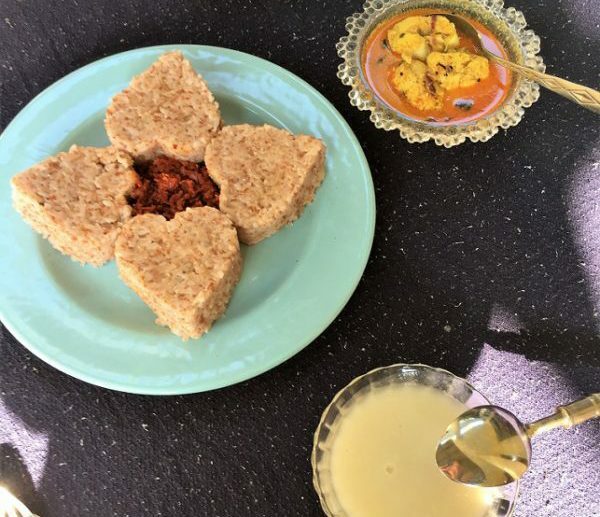 Delicious vegetable curries, crispy papadum and a special kind of rice. 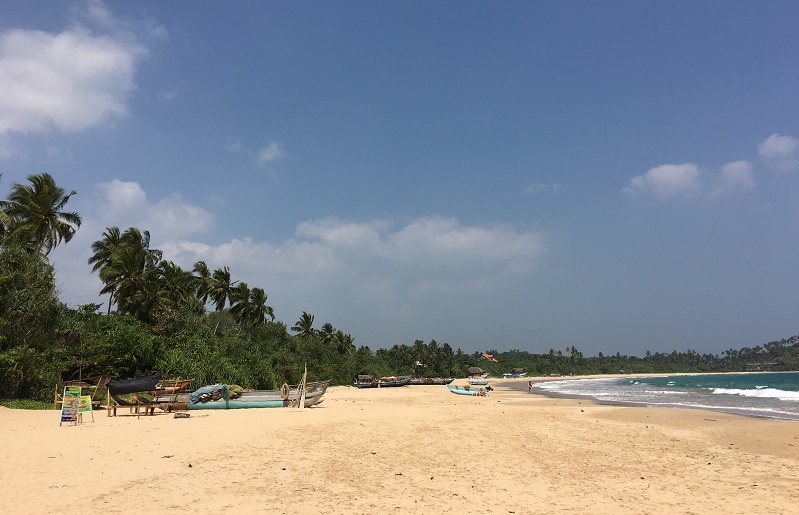 It’s only a 50 meter walk to beautiful Talalla beach! – No hot water in the shower (but hot outside, so not really a problem;-). • Agoda rating: 6,7 | Booking rating: 5,8 (surprisingly low!). • Price paid per night: 2500LKR/€16/$17. • Check Seaview Resort on Agoda and Booking. It’s very easy! Just get of the bus at Wajirawansa Maawatha bus stop (see Google Maps), cross the street and walk towards the beach. You’ll see Seaview resort on your left after about 300 meters. + Our only reason to spend a night in Udawalawe Junction was to visit Udawalawe National Park the next morning. There is nothing to do in the village itself so 1 night is enough. That being said, A to Z Guesthouse was a nice surprise! The room we stayed in was brand new and we got 2 queen-sized beds! WiFi was fast and overall our stay was excellent value for money. 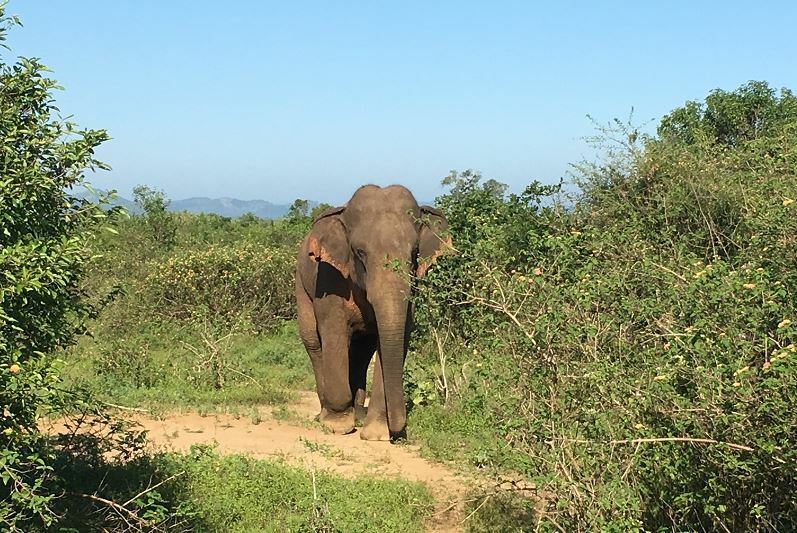 We booked a 4-hour safari via the guesthouse and paid 4500LKR per person. Don’t get me wrong, we had a great safari! But it’s just a little annoying to be told one thing and the truth turns out to be slightly different. Anyway, I still recommend to stay here, it’s a really nice place. • Agoda rating: 8,7 | Booking rating: 8,7. • Check A to Z Family Guest Udawalawe on Agoda and Booking. Get off the bus at the clock tower at Udawalawe Junction, there is a tiny alley just behind the tower. Keep walking until you come to a property on the left with a large green gate. That’s it! + Mount Breezevilla was such a great place. The price per night was a little higher than we had paid so far but this place is gold! The owners are so kind and welcoming and the room is wonderful. It’s a big room with a very large bed (even long enough for my tall husband!) and a good mosquito net. We had a large private bathroom with a hot shower (necessary in Ella as it gets a little chilly in the evenings). WiFi was great. One of the nicest places we stayed! • Agoda rating: 8,6 | Booking rating: 8,7. • Price paid per night: 3300LKR/€21/$22. • Check Mount Breezevilla on Agoda and Booking. It’s about 1 kilometer from the city center, but not difficult to find. Walk in the direction of Little Adam’s Peak and past Little Folley restaurant. There is a cluster of accommodation signs on the right, take that road and walk along the little road until you come across Mount Breezevilla (it’s on the right-hand side, a bit further than The Wisdom Home). + This accommodation is brand new, has big rooms and a stunning view! There are tea facilities, toiletries were provided and breakfast was included (toast, omelet, fresh fruit juice, fresh fruit and tea). The towels were very fluffy and there was even a bathtub! We didn’t use it but we did use the shower (hot water!). WiFi was fast and stable. The owners are very kind and went out of their way to make us feel welcome and at home. They helped us with laundry and gave directions for the hike to Ella Rock (the resort is more or less on the way to Ella Rock). And the view…. – It’s a little out of town, a 1,5 kilometers walk on Waterfall Road. • We got a discounted rate and paid 4000LKR/€25/$27 per night. • Check Ella Alpine Resort on Agoda and Booking. Just before the Curd Shop turn left (very steep road), walk up to Zion View, continue to Ella Eco Lodge and the railway tracks, follow the numbered guesthouses. It’s across number 6 (steep steps down). + Farwin, the owner, is a lovely host! He made us tea upon arrival and gave us a nice room with an amazing view. The second night we asked for extra blankets, it gets quite cold at night in Haputale! Breakfast was included and the delicious vegetarian dinner was 500LKR per person (different kinds of vegetable curry, papadum, rice, tomato and cucumber, as much as you like). Very good value! – The beds are not very soft but I’ve had worse. • Agoda rating: 8,1 | Booking rating: 8. • Check Bawa Guesthouse on Agoda and Booking. It’s not far from the railway station but it’s not so easy to find. Walk from the railway station to the main road and turn right (left is to the village), walk about 1km. Just before the big Olympus Plaza Hotel there is small shop selling water and snacks, after that shop there is a tiny dirt track going down the hill. Take that road, turn right and walk down and that’s were you’ll find Bawa Guesthouse. – This was probably my least favorite place in Sri Lanka (well, together with Hanoi Palace and Park View, see below). 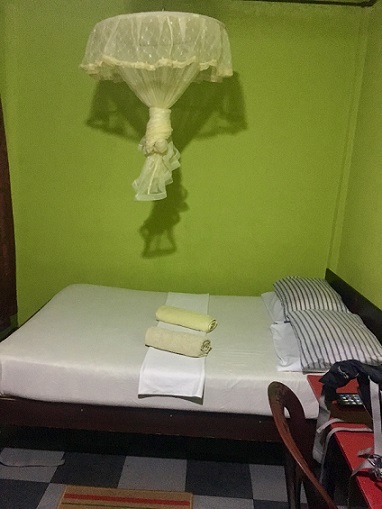 First of all, as with several of our accommodations in Sri Lanka, the location did not correspond at all with the map on Booking making it was very difficult to find. We asked several locals how to get there and after a lot of walking managed to find the place. When we arrived, there was no power (due to the heavy rain the previous days). WiFi was not available during our stay (the cable was broken and wouldn’t be repaired until after the weekend). However, our host kindly used his phone as a hotspot so we could still use a bit of internet. The shower did not smell clean. Let me rephrase that: it smelled terrible. Plus, we could not shower because the shower head was missing and there was only a hose. + On the plus side, the host is a chef and cooked us a delicious dinner! There were other travelers staying there as well and we had a great evening together. The bed was comfortable and the blankets were warm (essential in Nuwara Eliya). But I probably wouldn’t stay here again, which is why I am not providing links and directions. + Manik and Mahesh are great hosts and their children very cute! They greeted us every time we went out or came back to the house. The room is brand new and spotlessly clean (as is the shared bathroom). Mosquito net, blankets, towels, shampoo are all provided. WiFi was good too! Manik did our laundry (40LKR for underwear and socks, 60LKR for shirts and trousers) and was always helpful when we had questions. Altogether a nice place to stay! 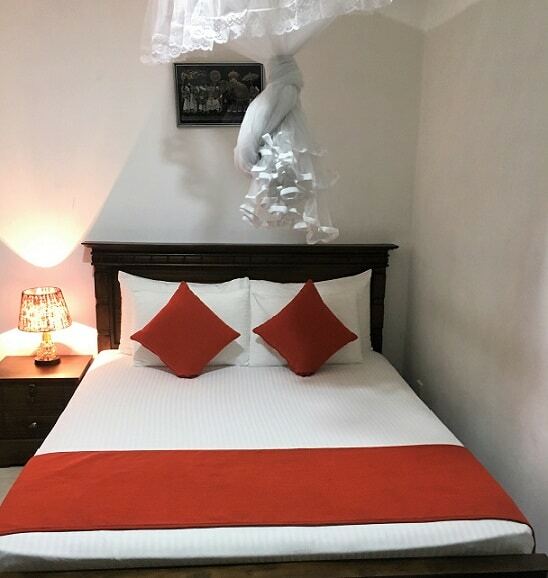 – The home-stay is 5 kilometers from the center of Kandy. Not a problem for us but something to take into account when booking. The road in front of the house is quite busy so we woke up relatively early because of the buses and trucks. • Price paid per night: 2250LKR/€14/$15. • Check the Travellers Home on Agoda and Booking. Take bus 602 to Kurunegala (12LKR per person), get off at Katugastota (directly after the bridge). Take the first street on the left and walk along this road until you see a Highlands Supermarket on the lefthand side. There is a road leading up to the house just after the shop. Open the big iron gate and there you are! There is also a bus to Hallolula (I think 651) that passes the house but that one doesn’t run very often. Or at least, we never managed to catch that bus;-). + Great location as this homestay is withing walking distance of the entrance to Lion Rock and Pidurangala rock. Clean room & bathroom (own bathroom). Easy to find and just 100 meter from the main road. Close to several restaurants. Breakfast (included) was nice, the first day we had milk rice and fruit, the second day pancakes with coconut and honey. A large mosquito net protected us from the many mosquitoes in Sigiriya). Great WiFi and very nice hosts. Comfortable bed and large room. • Agoda rating: 9 | Booking rating: 8,9. • Price paid per night: 3000LKR/€19/$20. 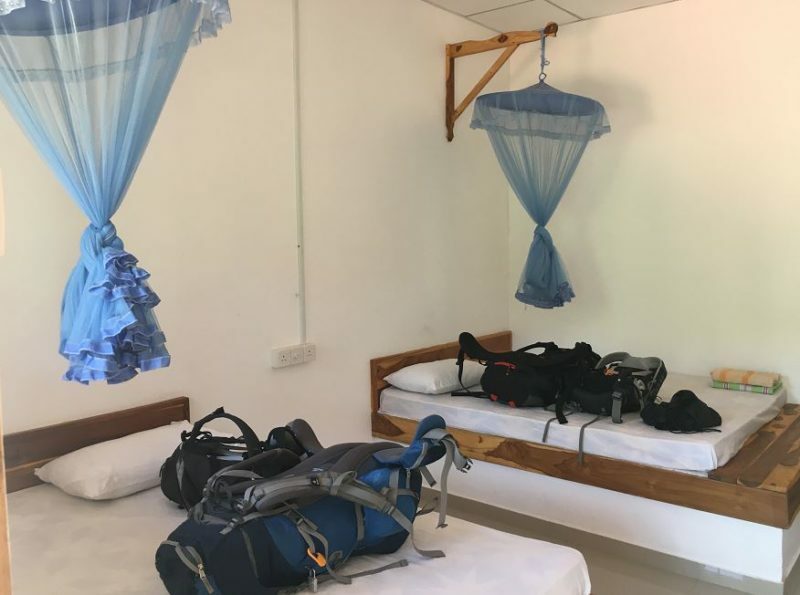 • Check Pathum Homestay on Agoda and Booking. – This hotel could be so much more than it is right now. It’s just a bit… neglected. The staff is nice but the entire hotel is dusty and slowly crumbling apart. Our room was so hot when we entered… We had a fan but that didn’t help. We had the door to the balcony and to the hallway open for hours in a desperate attempt to get the room to a manageable temperature. WiFi only worked in the hotel restaurant (which serves good omelets). Also, it’s 2km from town and it’s not easy to get a bus to stop. We walked to Jaffna Junction and whenever there were locals also waiting for the bus we could get on, if we were alone the buses didn’t stop. I have to say that was a first in Sri Lanka, everywhere else the buses always stopped to pick us up. Altogether not recommended, so no links and directions provided! After all, I can’t send you somewhere I wouldn’t opt to stay again myself. – We did not intend to stay here. I had booked the Blue Whale hotel for 2 nights but the first night was overbooked so the manager of Blue Whale put us up in Park View, a strange hotel… There was nobody there, I’m pretty sure we were the only guests! The room was big with 2 double beds but the ceiling above one of the bed was literally crumbling apart, leaving the bed covered in black dust. Not very appealing… We asked for towels and a sheet. We got the sheet but no towels. The bathroom smelled terrible, so I didn’t want to take a shower anyway. + On the plus side, it’s within walking distance from the station and WiFi was okay. Also, there was air-conditioning which was nice and despite the slightly odd mattress I slept well. But no, I don’t recommend staying here. + After our night at Park View we moved to Blue Whale. The room was clean, the bathroom a little less (it also did not smell so nice). There was air-conditioning and also a fan in the room. We stored our bags here during the day which was very convenient too. – Many of the staff members don’t speak English, which can be a bit inconvenient. WiFi didn’t work (well, there is a network but it was too slow to use). • Agoda rating: 7,7 | Booking rating: 7,4. • Price paid per night: 3400LKR/€21/$23. • Check Hotel Blue Whale on Agoda and Booking. 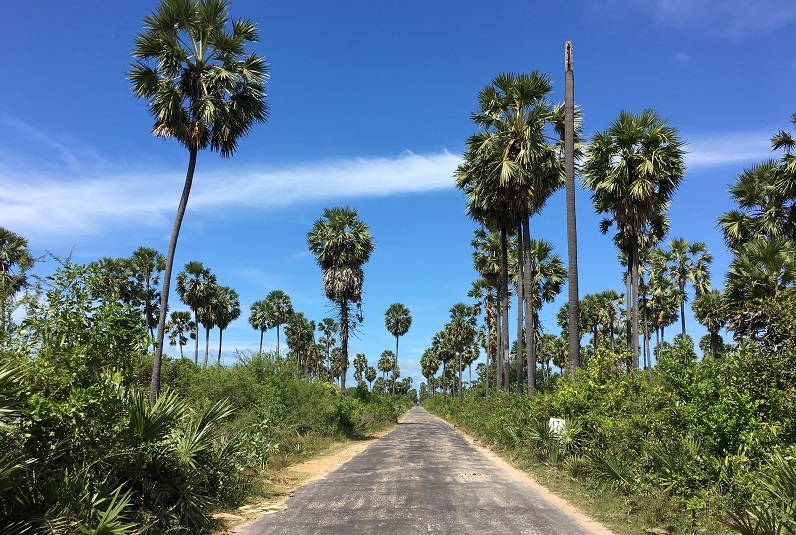 The hotel is easily reached by walking along the railway tracks for about 500 meters (in the direction of Anuradhapura). It’s on the right, next to the tracks. + Nethu Villa is a quiet place, with very kind and welcoming hosts. Excellent mosquito net, good bed and awesome bathroom (semi-outside). Breakfast was plentiful, delicious and different every day. Laundry service (500LKR per machine load) and scooter rental (1000LKR per day) available. You’ll need the scooter as the accommodation is not in Kalpitiya but in the tiny town Kandakuli. – Room 2 and 3 have a wall between them that doesn’t quite reach the roof, so you can hear everything your neighbors say. Not a problem if you have nice neighbors, but I suggest going for bungalow 1 if you have the option as this is a separate bungalow. • Agoda rating: 8,4 | Booking rating: 8,6. • Check Nethu Villa on Agoda and Booking. We took a bus from Puttalam to Kalpitiya, got out at Kandakuli junction and took a tuk-tuk to Nethu villa (300LKR). A final note: Sri Lankan hosts go out of their way to make you feel at home! They will do everything they can to make you feel comfortable and even if they speak little English they will strike up a conversation and ask you: Where are you from? How long have you been in Sri Lanka? Where in Sri Lanka did you come from and where are you going next? For me, the hospitality of the Sri Lankan people really contributed to our travels around the country! You can download the map with the accommodations below. Let me know if you have any questions! 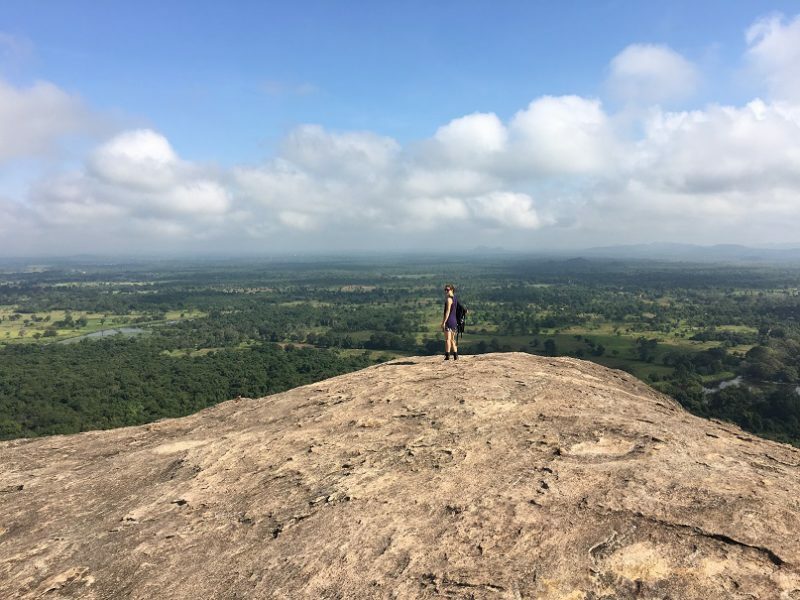 Want to read more about Sri Lanka? Read about our daily travel budget here. Disclosure: Please note that this article includes affiliate links, and at no additional cost to you, I will receive a small percentage of the sale if you decide to book a hotel. Your support is very much appreciated, it helps me to keep this blog running and create more useful content! Please know that I only recommend hotels that I have a positive and personal experience with. I never provides links for places I would not opt to stay again myself. If you have questions about a hotel, please don’t hesitate to contact me. Thank you for this kind reviews, this will be really helpful in the future! I really like how you are always organized and have the price, the exchange rate, the location, the review, etc! It makes me stress a little less in terms of going out there myself someday! Today’s Sri Lanka is not life before. Happy to see Sri Lanka turning into a tourist heaven. 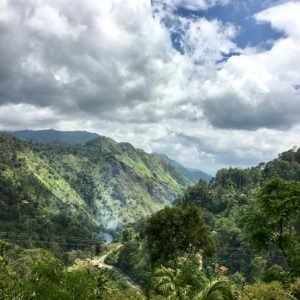 And thanks to travelers like you for showing how to go about in Sri Lanka. Thanks for the wonderful info, im definitely putting Sri Lanka on my travel list! Great post. 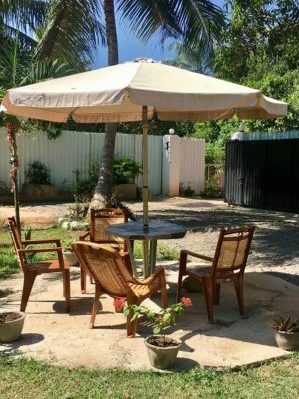 We just booked our trip to Sri Lanka and so are scouring looking for info. What a treat to find your posts filled with great information and tips! Thank you so much for taking the time and making my research so much easier! One question: did you book most of your accommodation ahead of time? I’m not a huge fan of looking for a place the day of – I’d rather spend time exploring/having fun! I’m hoping those are all affiliate links and I can help you out for all the work you’ve done!! Thank you so much for your kind comment! I’m so happy to hear you find my Sri Lanka posts helpful:-). 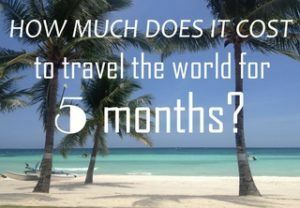 How long will you be traveling around Sri Lanka? About your question, we booked one city/place ahead. I hadn’t planned out our itinerary so that worked best for us. 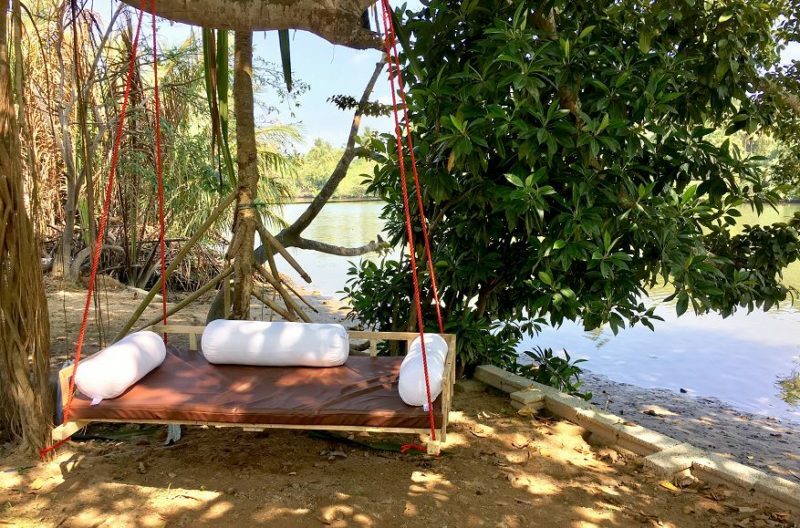 However, if you already know your itinerary you can easily book your accommodation before your trip so you don’t have to worry or spend time on finding a place to stay during your time in Sri Lanka. Haha yes they are affiliate links and your support is very much appreciated!!! Have a wonderful time in Sri Lanka and let me know if you have any other questions. Thank you for your kind words:-). I was in Sri Lanka in February and while there were mosquitoes, it wasn’t that bad. Buy a good spray and cover up during dusk and dawn. 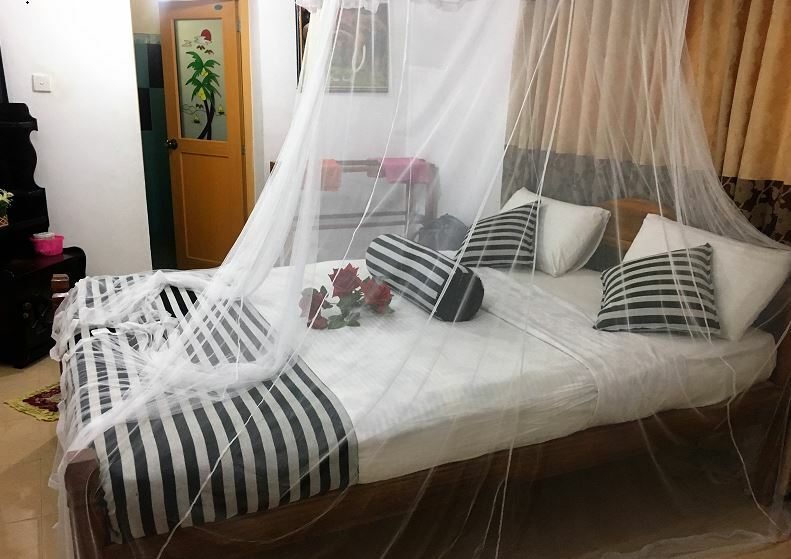 Every accommodation we stayed at had a mosquito net so no waking up covered in bites;-). I’m so glad I stumbled across you post! Myself and Bob are going for 6 weeks and your post is really going to be a great help to us. We are thinking of a 6 week trip. We are off to Vietnam this January for 6 weeks and the year after that we’ll be going to Sri Lanka. We do a trip every year for 6 weeks. – Did you book all the hotels/guesthouses before beginning your travel or did you book some while you were already in Sri Lanka? – Do all hotels and guesthouses organize excursions for their customers? Is that the best way to do such excursions? – We booked all accommodations when we already in Sri Lanka and never had any issues to finding a nice place.